I’m directing a play with two actors in the title role. And they’re both named Jennifer. Snap! How’s that gonna work? There were a few raised eyebrows when I pitched the idea. Some people asked me if I’d thought this through. The answer is yes. And uh, no. I directed Shirley Valentine back in 1995. And I remember the enormous challenge it was for one actor. Smart comedy monologues aside, carrying a show by yourself is hard work. Lots of lines, indeed. And it can be lonely. After all, she’s out there by herself. I decided to cast two actors this time. Theatre is all about making strong choices, right? And I figured it could only enrich the process for everyone. 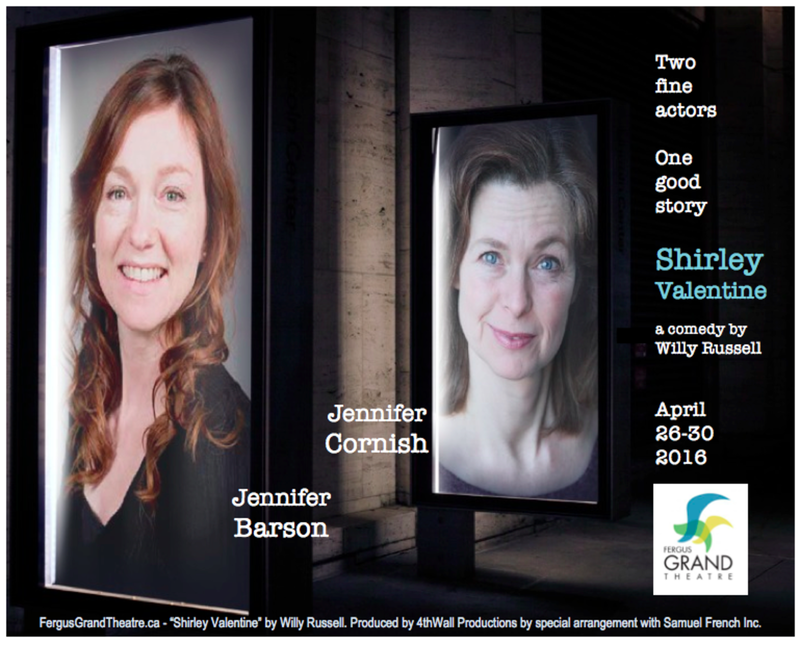 Jennifer Cornish and Jennifer Barson will star as Shirley in alternating shows. That’s two takes on one much-loved character. On the same stage. So, would the two Shirleys be the same or different? I had no idea. But I do know that a good actor isn’t the same as anyone else. She convinces us that she is the character. And she allows her own, unique personality to help shape her performance. It turns out, I’ve got two very good actors. 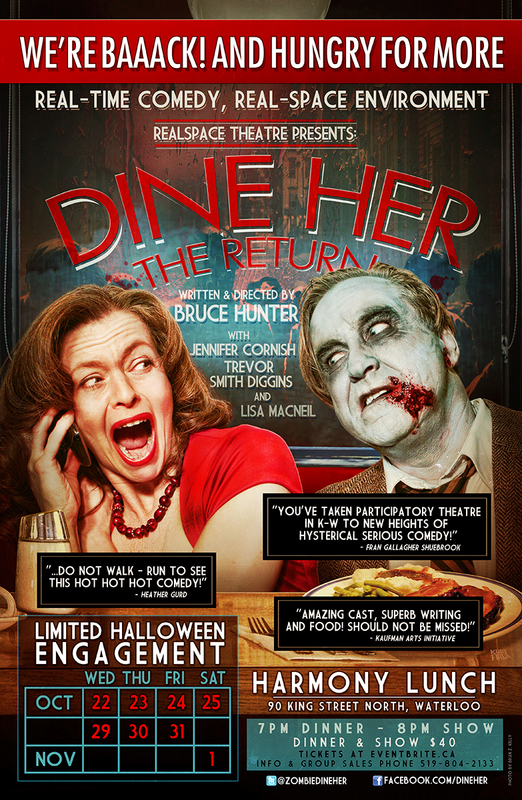 I got to know Jennifer Cornish when we shared a zombie apocalypse in the RealSpace Theatre zom-com Dine Her by comedian Bruce Hunter. I already knew she had the acting chops, just like everyone else who has seen her work. Jen has tackled numerous roles on stage and film, and is known for bringing honesty and commitment every time out. In 2011, she received a Region of Waterloo Arts Award for Performing Arts for her outstanding work in the theatre community. I also knew she was no stranger to the one-actor format. Jen’s acclaimed performance in the Irish play Myra’s Story continues to earn raves far and wide. And for very good reason. You can tell the gang on 42nd Street that Jen will soon be there. 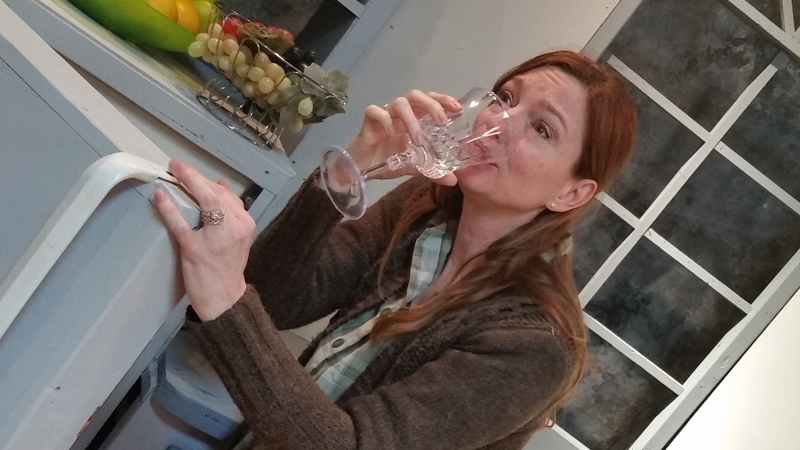 Headed for New York in November, Jen will perform Myra’s Story at the United Solo Theatre Festival just off Broadway. That’s the largest festival of its kind in the world. Nice gig. In the meantime, how does this Jennifer feel about approaching the role of Shirley? 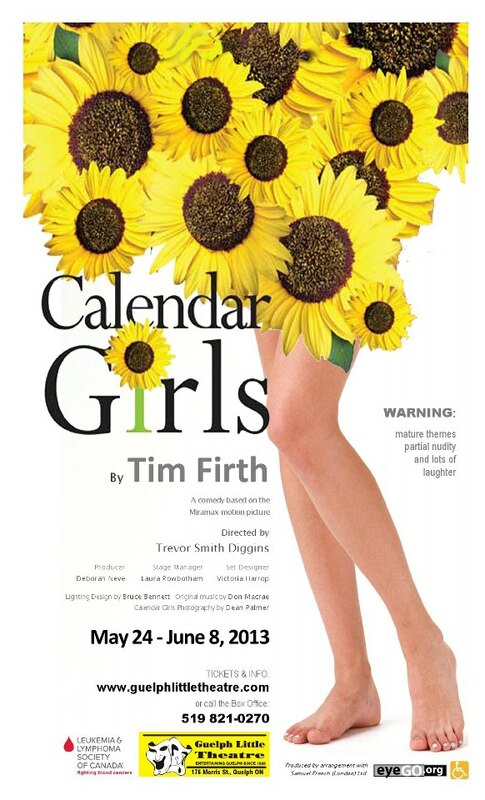 The first time I saw Jennifer Barson on stage I was directing her as Ruth in Calendar Girls. I knew then I had a very special actor on my hands. Her sensitive performance won Jen an Arthur Wilkinson award for best actress that season. And it was well earned. This Jen is a very busy actor and entertainer in her showbiz community. She often teams up with her rockstar husband Paul Pengelly. He’s the dynamic lead singer for The Vanishers and a real prince charming in Into The Woods. Jen and Paul at Sip Club in Guelph. 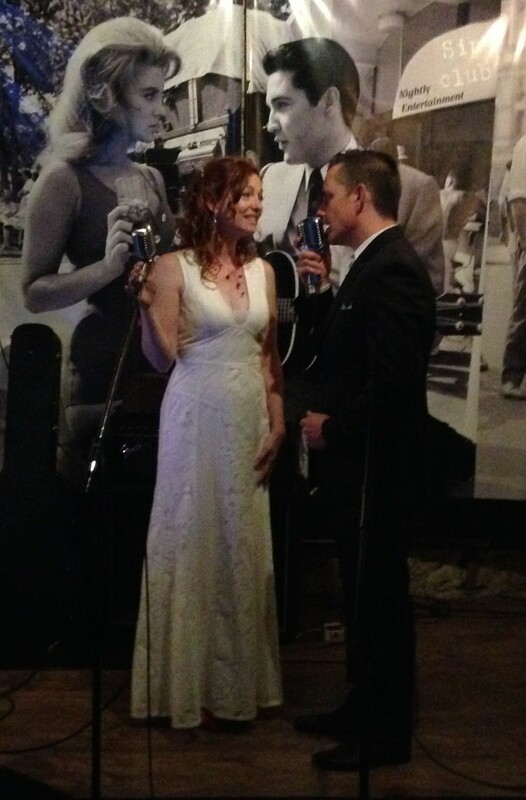 Between acting and music gigs, this entertaining couple play hosts for Trivia Night every Wednesday. Last year, Jen showed her talent for comedy as Poppy in Noises Off, and she has played many great roles in between. Other more dramatic favourites were Amanda in The Glass Menagerie, and Mrs. Lyons in Blood Brothers, also by Willy Russell who wrote Shirley Valentine. 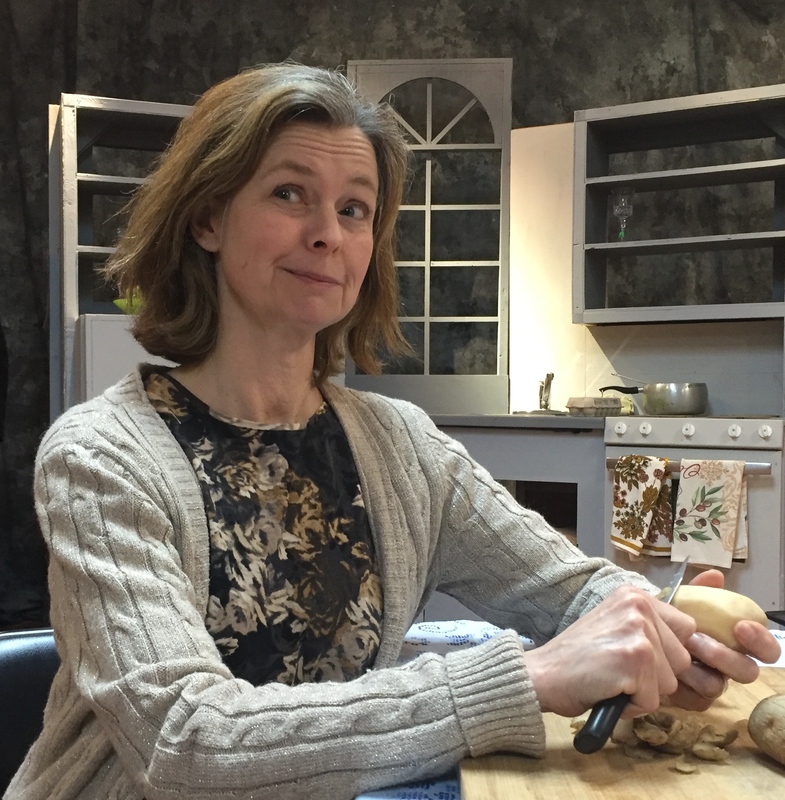 Up next for Jen is an original play, At The Crossroads by Stephen Young, coming to the Waterloo Region Museum in June. The historical one-act takes place in 1916 as the municipality of Berlin is renamed Kitchener, Ontario. So how does this Jennifer enjoy the role of Shirley? “She is spontaneous, spirited and beautiful and recognizes her stage of life and her part in that,” says Jen. So, I guess it’s working like a charm. Well, like two charms. 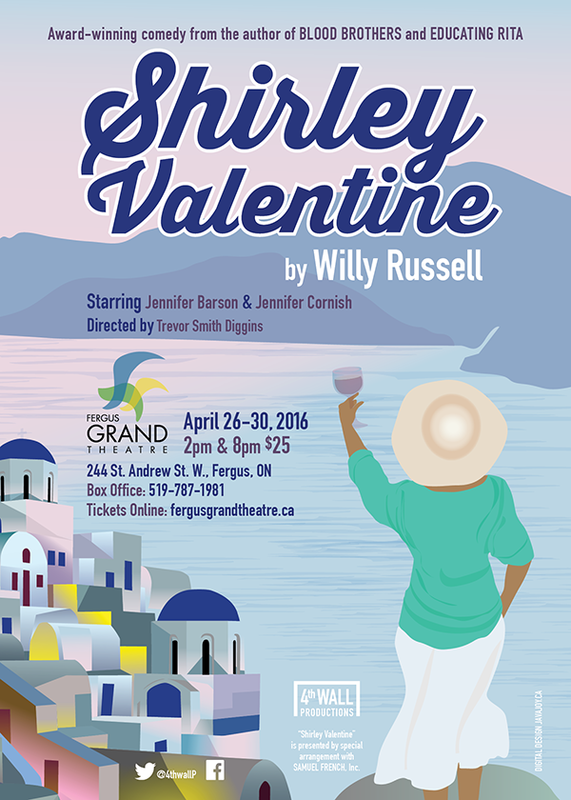 Shirley Valentine by Willy Russell, presented by 4thWall Productions at the Fergus Grand Theatre April 26-30,2016. Follow us on Facebook and Twitter. Or check out this video for complete details. There is only one Shirley Valentine. But when this classic comedy opens at Fergus Grand Theatre for 10 shows in April, you might want to be seeing double. 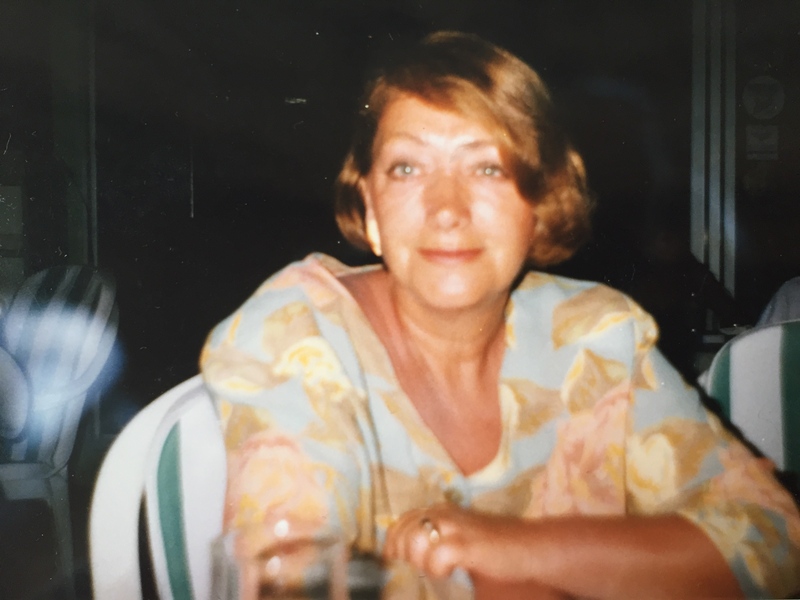 The 1995 sold-out shows starred Veronica Punnett in a standout performance as Shirley Valentine. She is still my inspiration. The new production is being reimagined as a tribute to my dear friend in heaven. I was wondering if you were going to have the 2 share the stage on the same night- that would really throw things for a spin! It sounds like you have a great show on your hands, and quite possibly 2 great shows! I haven’t heard of Shirley Valentine, but it sounds like I’ve been missing something. I’ll need to learn more! Hey Philly – yes, that would be a very different spin. But no. Just one actor onstage at a time ;). Check out the movie version some time; it’s classic. Cheers!